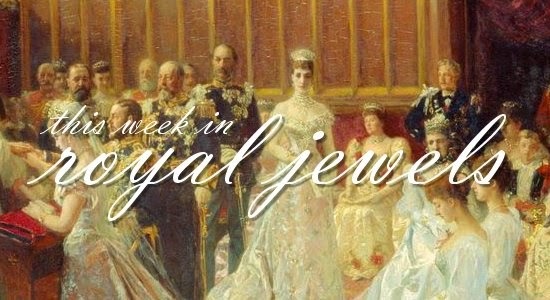 Pearls and earrings dominated this week -- be sure to cast your vote for your favorite bejeweled appearance! 10. Looking happier than I've ever seen her, Princess Charlene of Monaco helped to celebrate the festival of Monaco's patron saint, Saint-Devote, on Monday. She wore simple diamond stud earrings for the occasion. 9. The Danish royal court has announced the schedule of events to celebrate Queen Margrethe's 75th birthday this April, and there's a gala on the docket. You know what that means: major, major European tiaras! Mark your calendars for April 15! 8. Crown Princess Victoria's earrings were appropriately lively for the European Figure Skating Championships, where she danced in the stands along with her daughter, Princess Estelle. 7. Queen Maxima went light on the jewelry for an education fair on Wednesday, though she did don her usual set of bracelets. 6. Photographers offered us a great view of a familiar jewel -- Camilla's diamond-clasped pearl choker -- at an Australia Day event on Monday. 5. Queen Letizia wore her diamond pave drop earrings to a meeting at FEDER in Madrid on Tuesday. 4. Queen Mathilde wore gold earrings -- and a rather unusual "hat" -- at Saturday's opening of Mons 2015. 3. To meet with survivors on Holocaust Remembrance Day, the Duchess of Cornwall donned her small diamond clover brooch and pearls. 2. Crown Princess Mette-Marit also attended a memorial ceremony on Holocaust Remembrance Day, and she also wore pearls (a traditional choice for occasions of memorial and remembrance), selecting a long, sautoir-like necklace. 1. Queen Letizia dazzled at a symposium on Thursday, wearing a gorgeous pair of diamond girandole earrings.